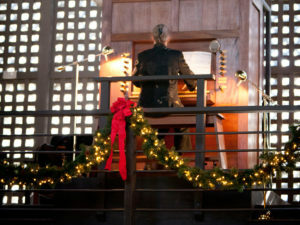 The Greg Harrold Pebble Beach organ was installed in Erdman Chapel at Robert Louis Stevenson School in January, 1992. The organ is voiced in the North German style, the classic expression for an organ’s tone. Mounted high in the balcony, our chapel provides an ideal location for perfect sound projection. The glass facade at the front of the chapel serves as a primary sound reflector and gives an appropriately slow decay time for the sound. Erdman chapel, a relatively “hard” room, acoustically, enhances the organ’s splendid sound. The organ has a mechanical action: the keyboard and pedal board are directly connected to the pipework by trackers, rollers, and levers. Apart from the blower, there are no electrical parts in the organ whatsoever. Mechanical action is favored by many organists because the touch of the key has a direct relationship with the “speaking” of the pipe. Mechanical action was universal until the middle of the nineteenth century when electro-pneumatic action was developed to cope with ever expanding organs. The survival of the earlier instruments attests to their durability. A necessary requirement for a mechanical action organ is that it be “vertical” in design so that the “trackers’ which connect the keys to the pipe valves may pull down directly. The high ceiling of the Erdman Chapel is ideal for this system. 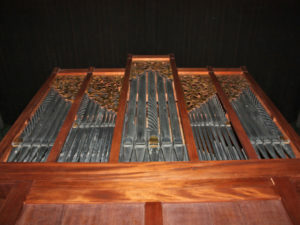 The organ is fully encased in Honduras Mahogany, necessary for proper tone mixing. Many contemporary organs are placed in a room or alcove or any convenient space and lose any benefit of case sound reflection. The wooden case responds to sound vibrations and serves to “pull together” the speech of the instrument. All of the classic instruments were so encased. There are two manuals and pedal fitted. The Great Organ on the lower manual contains a straightforward ‘principal chorus of four stops. The upper manual or “Positive” division contains contrasting tonal colors. This Positive Division has a flute character but the Nazard and Tierce, with their odd length pipes, add bite and definition. The organist chooses these stops in various combinations for multiple effects. There is no volume control on this organ, no louvers to swing open and shut in front of the pipes as in a “Swell” division of an organ. The Pedal Division contains three ranks of pipes, providing definition, volume and dramatic power. The Pebble Beach organ also has a tremulant. Not all organ pipes are as long as their foot length might suggest. Some are of half length or “stopped” pipes. The pitch is the same but takes advantages of certain characteristics of sound waves within the pipe. 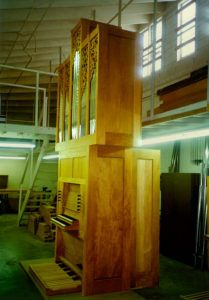 The Harrold Pebble Beach organ is thirteen feet high and cannot contain an open 16′ pipe. So, for example, the biggest 16′ pedal pipe is really 8′ in length. This is common practice on all organs. The North German is unusually sweet and smooth. This is partly the result of the skill of Greg Harrold in “voicing” or preparing the pipes. Final voicing occurs in Erdman Chapel so that the organ speaks properly. Another factor is the moderate wind pressure which is used in this organ, 3 inches as measured by the traditional water column. Organs have had much higher pressures; the theater organs of the twenties could have pressures of 20 inches or more on certain ranks of pipes which were very loud and piercing. The Pebble Beach organ can be described as “sweet” with a very pure unforced tone quality. It is best suited to the classic organ repertoire along with some modern organ works. Organ music which depends on bombast and massive sound effects is not suited for this instrument. As an accompanying instrument for church service music, it serves splendidly, giving definition but not overwhelming congregational singing. For an organist to confront this instrument, a technique of precision is required. The absence of all electrical and pneumatic power devices means that the organist is in very direct control of the tonal registration. There are no helps, no aids, no quick fixes possible with pre-arranged registrations. The very pure speech of this Pebble Beach organ also magnifies errors. This is the reason why the mechanical tracker organ is favored by many keyboard artists because the organist can translate creativity at a more responsive level. Furthermore, the traditional straight pedal board, in which the pedals are parallel and not splayed, requires an older technique of footwork. A greater reach is needed which can add drama to an exciting piece for the observer and challenge for the artist. The Greg Harrold Pebble Beach organ at Stevenson School is a superb example of the classic organ and has no parallels in this area. The ideal setting of this instrument in Erdman Chapel makes possible the realization of superb and uncompromised organ music.